Digital Convergence offers a strategic approach to the integration of instructional and curricular innovation with technology tools to modernize learning at scale. Access case studies of several districts on the path to modern learning at scale in the State of the Industry Reports on Digital Convergence below. Click here to access the file.  The Framework provides a blueprint to a) engage stakeholders in the future of learning to envision modern learning experiences, b) architect the instructional & technological pathways to incorporate our vision into instructional practices, and c) establish teacher proficiency in facilitating modern learning. Through annual membership with Modern Teacher, access the Digital Convergence Framework housed within modernteacher.com — a change-management platform designed to organize, facilitate, and support your Digital Convergence journey. Watch the following short video to learn more about the opportunities available through modernteacher.com. The first book in the series sets the context for change by providing compelling reasons our nation’s schools need to meet the demands of the 21st century. Dr. Smith explores the strategic planning within the first three Stages of the Digital Convergence Framework. The second book examines the shared experiences districts face as they enter Stages 4 and 5 of the Digital Convergence Framework identifies patterns among districts that drive and inhibit progress, and it explores the ways districts can use the Framework to gain insight and overcome any barriers. The third book explores the evolving role of the community in redefining the future of learning for students. In this book, Dr. Smith focuses on new success indicators that engage each student in the learning process, helping them find their role in their community and secure a path toward it. Let us know a little bit about you and your district, and one of Modern Teacher's team members will be in touch shortly.